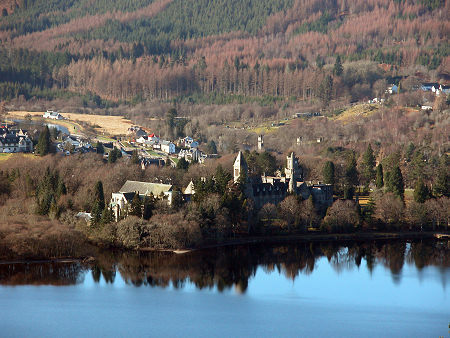 Fort Augustus was originally named after St Cummein, who built a church here: being known in Gaelic as Cille Chumein. 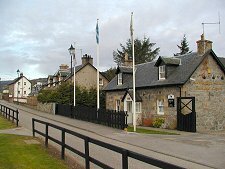 The current name was an imposition that accompanied the building of a fort, Fort Augustus, after the defeat of the 1715 Jacobite uprising. The fort, and so in turn the village, was named after King George II's younger son, Prince William Augustus. That same son later became the Duke of Cumberland, the infamous "Butcher Cumberland" who was responsible for repressing the Highlands and destroying the ancient clan system after the final defeat of the '45 Jacobite uprising at Culloden. There is irony indeed that in the aftermath of Culloden he made his headquarters in the fort named after him a quarter century previously. Today, almost nothing remains of the original fort, parts of which were incorporated into the Benedictine Abbey when it was built in 1876, and whose imposing presence confronts the road traveller from the south as you enter the village. The community of monks was unable to sustain itself and left in 1998. 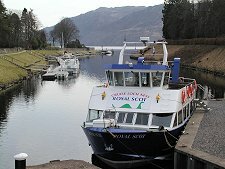 Fort Augustus's other main claim to fame lies in its bisection by the Caledonian Canal. To the north the canal enters Loch Ness, and within the village itself is a flight of locks that provide a fascinating place to watch the world go by. With the launch in 2002 of the Great Glen Way, the 73 mile long distance path from Fort William to Inverness, the canal towpath also brings a steady stream of footsore travellers seeking food and accommodation. 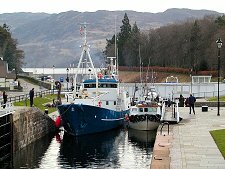 Immediately next to the locks is the Caledonian Canal Heritage Centre, an excellent place in which to gain an insight into the history and operation of the Canal. This is part of an extremely attractive centre to the village built along either side of the locks and which together must rank as one of the best designed and maintained collections of buildings in any comparable village. 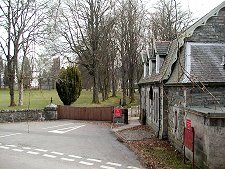 Visitors to Fort Augustus can also enjoy the Clansman Centre where you can experience clan life five hundred years ago. Everyone who has heard of Scotland has heard of the Loch Ness monster. 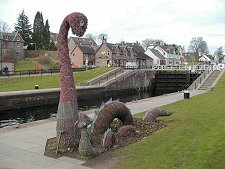 Fort Augustus is the only place where you are guaranteed a sighting of Nessie, living next to the locks on the Caledonian Canal. Actually, you will see a number of artificial Nessies on any trip up the length of the Loch: but without doubt this is the one we enjoy the most (see picture, above left). For most people, Fort Augustus is somewhere you drive through en route up or down the Great Glen. To do so without stopping is a mistake. With its focus on the canal and with some very nice shops, it is an excellent place to stop for a while.